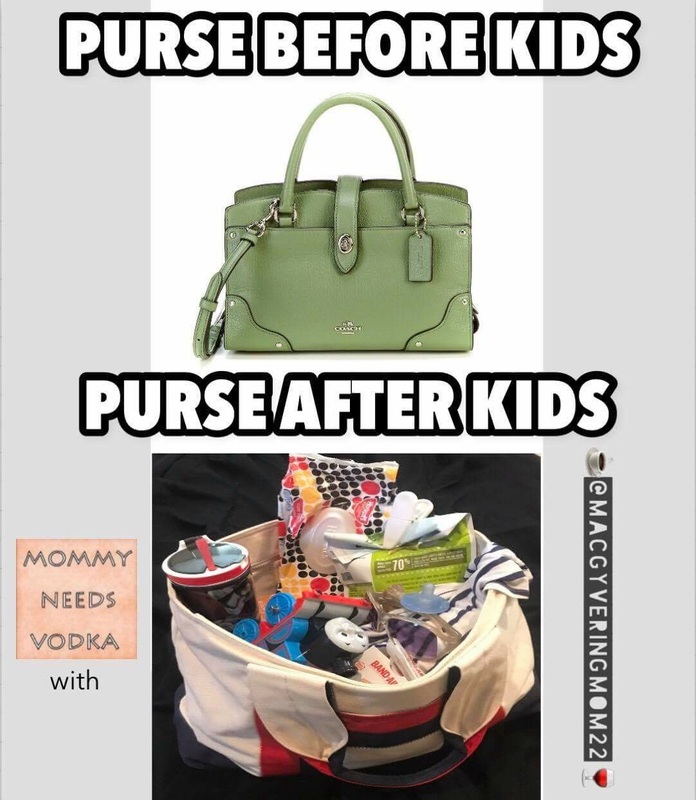 Before I had kids, I always used a cute Coach bag to carry everything I needed. I actually have three Coach’s hanging in my closet, two of which have been there for ten years now. After I had the twins, naturally came the switch to a diaper bag. Problem is, the kids are out of diapers now, but instead of going back to Coach, I’ve not been able to downgrade from a large tote! Recently I overheard my son say, “My mom’s got everything in there!” So it prompted me to look, and sure enough, I found everything from a plastic dinosaur to a spork from Taco Bell to the torso of a Lego minifig. 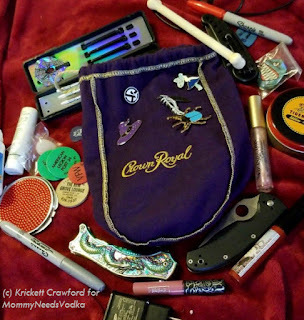 It prompted me to ask the followers of my Facebook page to ask what they have in their purses. 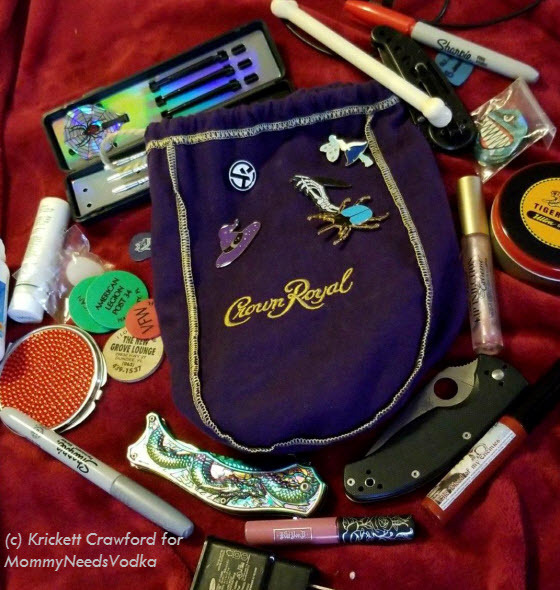 Naturally, they did NOT disappoint….everything from a flask of bourbon to a pencil with a decapitated emo doll head on the eraser are in these bags! Wandalis Velez writes, “A fork…in case cake happens!” Not a bad idea! She sounds like a feisty, wonderful lady! 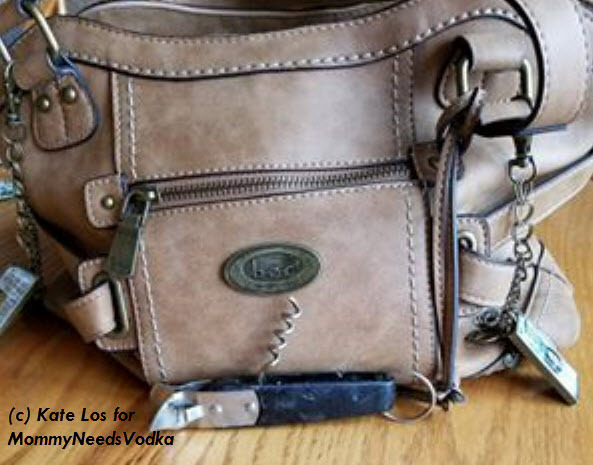 Kate Los has been one of my favorite page fans for years, so naturally she can’t go anywhere without a wine bottle opener! What would happen if someone encountered an unopened bottle of wine in the wild? Kate to the rescue! 6. Gin and Tonic…cleverly disguised! She wins the day with this one! Shannon Stebbins isn’t taking any risks going into the restroom with an empty shopping cart left outside. As someone else pointed out, you can never find a store employee when you need one, but an in-use cart disappears in seconds. The solution? 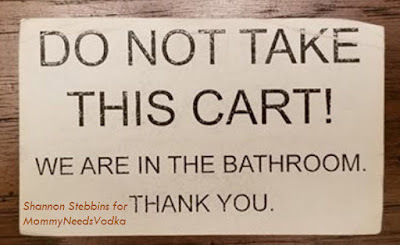 “A homemade card that reads “Do not take this cart. We are in the bathroom. 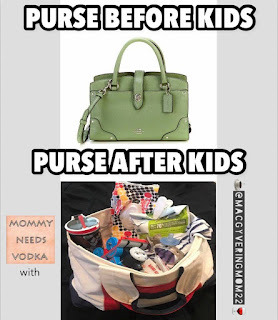 My kids are all grown, but I still use it.” Brilliant! So sweet, Jen Mills keeps the first feather she found after her sweet furbaby passed away. Roxann Therres is prepared. 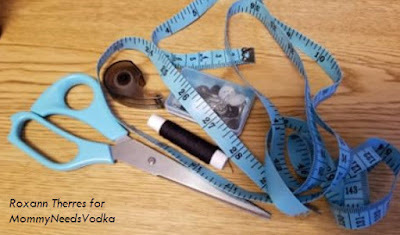 ” I have a roll of scotch tape, scissors, a sewing kit and a tape measure. You never know when you need to win a baby shower game.” Smart thinking! 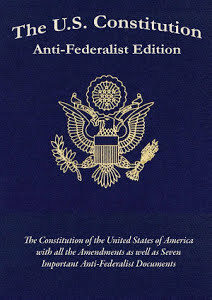 A pocket sized copy of the Constitution. Handy if you need to know your rights on the spot, or if you’re just bored waiting in the doctor’s office. 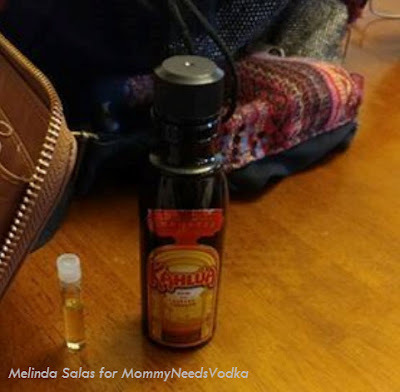 Melinda Salas wrote, “Anointing oil on one side and a travel size bottle of Kahlua on the other side. You know because….Sometimes you feel like an angel sometimes you feel like the devil.” One of my favorite responses! 14. 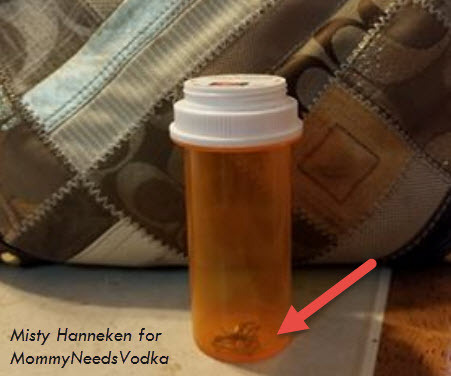 A Spider in a Vial! Agreed! Glad you caught him. I think Melanie Gannon is right that no one else probably has these in their purse! 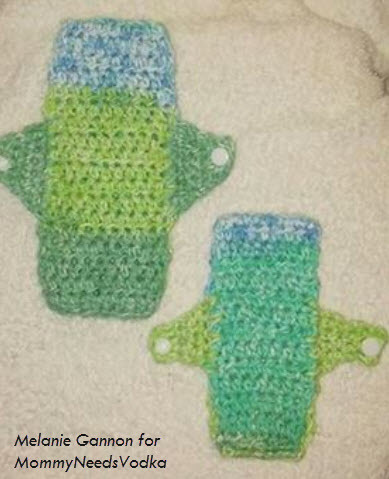 She writes, “A crocheted washable sanitary napkin that I made myself.. I haven’t bought maxi pads in years. I treat them just as you would a cloth diaper and they are much healthier and sanitary. 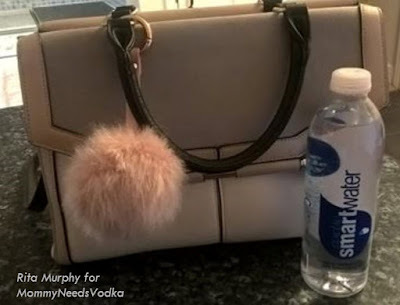 I would be delighted to find one other person on the planet that had one of these in their purses.” Great for the environment, but she’s a better person than I am! 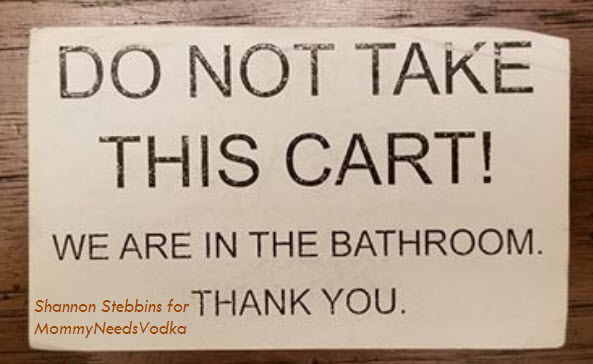 She has a point – there were no disposables in the olden days. So there you have it, folks! I love interacting with my Facebook fans, and am so fortunate to have such great people on my pages.